Glenwood Towers has a history of false fire alarms, records show. 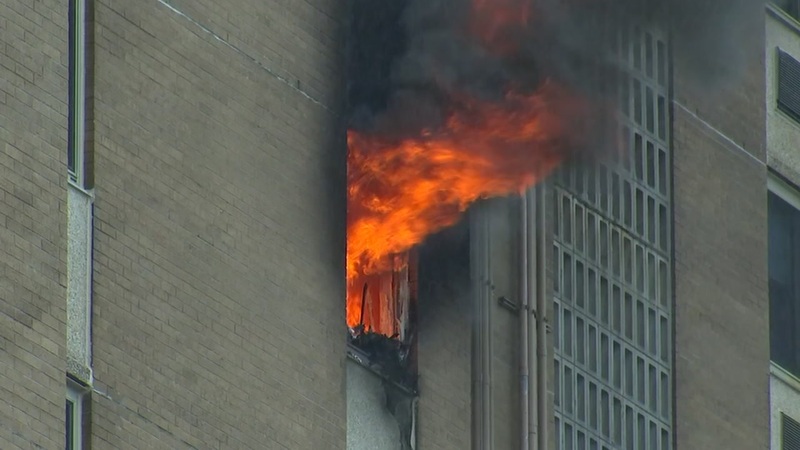 RALEIGH, N.C. (WTVD) -- A review of records through the City of Raleigh's Fire Marshal office show Glenwood Towers, at 509 Glenwood Ave., was inspected Wednesday, just two days before a fire that sent six people to the hospital and forced the evacuation of more than 100. A representative with the City of Raleigh sent an email to ABC11 saying, "it was the annual fire inspection that was done earlier this week. Nothing major was found." Upon further review, records also indicate there have been 153 fire calls dispatched to Glenwood Towers dating from January 1, 2017, through this week. The most recent false alarm was this past Monday on the 13th floor. Most incidents are for "smoke detector activation, no fire-unintentional." The second-most recorded incident received is labeled as "detector activation, no fire-unintentional," Followed by the third, categorized as "dispatched and canceled en route." The figures back up what displaced resident, Paulette Blakey told ABC11 on Friday: "(Fire alarms) go off a lot so you kind of don't pay attention until the large -- big one goes off. She was in her apartment when the fire started in the next unit. "I could hear (my neighbor's) smoke alarms going off," Blakey said. "I started smelling something and said 'oh this is real.'" On August 19, 2016, Glenwood Towers was found to be out of compliance and "fire detection, alarm and extinguishing systems shall be maintained in an operative condition at all times, and shall be replaced or repaired where defective. Nonrequired fire protection systems and equipment shall be inspected, tested and maintained or removed." Also, firefighters said they responded to the facility for five false alarms in a 24-hour period. Records show staff corrected the issue on December 12, 2016. Detailed in the fire's incident report is the cause of Friday's fire being ruled "accidental" and that 25 percent of the building was damaged. Blakey does not believe a cigarette caused the fire because the building is smoke-free. However, she said she feels the fire could have started in the kitchen as her neighbor was yelling for someone to call 911 -- knowing the fire would spread much larger. Displaced residents have been relocated with family and friends or with a Red Cross shelter at a church in Garner. Repair crews told ABC11 that the damaged units could take weeks, and in some cases months, before becoming inhabitable -- depending on the type of material needed for reconstruction.